Pucker up, baby; your prince is here. Mortimer Toynbee was a greedy, pathetic little toady when the genetic evil mutant known as Magneto took him in as a member of his original Brotherhood of Evil Mutants. But years of hard knocks toughened the Toad's hide, and the once-sniveling creature grew a spine. Now, a leaner, meaner Mortimer stands poised to exact revenge on all those who mistreated him. The X-Men movie did a lot of impressive things: it showed that there was still an audience for good comicbook movies, it proved that you can appease fanboys and still get real people into the theatres, and it made ensemble movies seem like a feasible idea again. Impressive as all that was, there was one more feat it accomplished. X-Men was the first time anywhere, ever, that Toad had seemed like a viable threat. In the comics, Toad never even seemed to have much of a mutant power; he could leap and jump, but it was never portrayed as anything overly spectacular. He looked a little weird but, since he was created back in the days when Jack "I'm paid to draw, not to erase" Kirby was handling the art, not that much stranger than anyone else. There had never been a comic-based figure of this long-standing mutant until ToyBiz dropped him in the first Marvel Legends line. A series intended to coincide with the movie and dubbed "Evolution of X" would pair each character from the film with a new sculpt of their comic counterpart. Toad was the second figure planned for the line, but we hadn't even seen his sculpt by the time the idea died. Standing 5 1/4" tall, Toad is a wonderfully disgusting sculpt. He's wearing the yellow and purple jester's costume in which Magneto dressed him; in fact, it's the precise costume that Magneto gave him - it's faded, worn, stretched and filthy, and there have been rather clumsy repairs attempted. Toad is a pathetic wretch, and looks like he's been wearing the same suit forever. Toad moves at the neck, shoulders, left bicep, wrists, waist, hips and boot tops, making him the least mobile Marvel Legend. While everyone always referred to Toad as ugly in the comics, it's hard to convey unless everyone else has photo-realistic looks; how do we know that he's not just slightly cartoonier than those around him? In figure form, however, poor Mortimer's distasteful looks really come through - he's got bloated lips, beady little eyes and a generally swollen look. Hey, much like a toad! Imagine that! Toad, in the movie, was nothing like the comicbook version, and that was a very good thing. 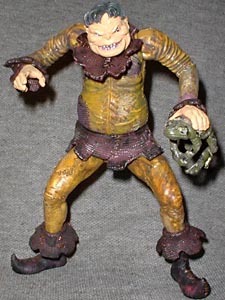 The make-up effects turned Toad into a truly reptilian mutant, and Ray Park gave the little guy a sense of respectability that made the character much more interesting. Like the rest of the Marvel Legends, Toad comes with a detailed base, though his is a bit of a cheat. Simply a reused mold from the (then recently deceased) Spider-Man Classics line, the base still looks great. 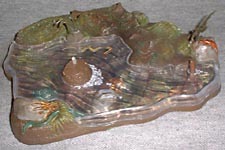 Taken from the Man-Spider figure, the base is a rustic scene; a small stream runs past some marsh grass with a few aquatic creatures nearby. The "water" is a separate piece of clear plastic, molded with the bubbles and ripples of moving water, and can be removed from the base entirely if you decide you'd like to have a drought. Toad comes with a reproduction of X-Men #4, the issue that introduced him and the rest of the Brotherhood of Evil Mutants. It's a fairly forgettable issue, but then, so is most everything else Toad has been involved in. He's not the best mutant in the Marvel Universe, but he has potential. Why did everyone completely ignore all the cool stuff that Fabian Nicieza did in X-Men Forever? Tell us on our message board, the Loafing Lounge.